GuitarControl.com released a new video guitar lesson from GuitarControl.com instructor and creator Claude Johnson. 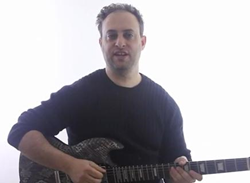 In this guitar lesson, now available on YouTube.com, Claude Johnson teaches an easy pentatonic guitar lick using the legato technique. Claude demonstrates this cool lead guitar lick in the key of D as follows. 13th fret of the first string bent up one whole step and then released with 3rd finger and then to the 10th fret with first finger followed by a hammer-on and pull-off to and from the 13th fret. Next Claude slides down to the 8th fret and does another hammer-on and pull-off to and from the 10th fret and then to the 10th fret of the 2nd string with 3rd finger. Next Johnson goes back to the 8th fret of the first string and then back to the 10th fret of the 2nd string and does another legato lick from the 8th and 10th frets of the 2nd string and finally ending on the 7th fret of the 3rd string with first finger. Guitar TAB’s are available for this easy lead guitar lesson at GuitarControl.com. Legato is Italian for “tied together” and in musical terms means that notes are played smoothly and connected with no interval silencing between notes. Legato is achieved on guitar when playing a sequence of notes using hammer on & pull off techniques. GuitarControl.com is the leader in modern guitar instruction. It’s packed with recourses including articles,video lessons, and the best videos in the business for the beginner to the advanced guitar student taught by the best instructors out there. Weather you are into the blues, rock, jazz, metal, folk, or anything in between, they have you covered.